Architecture: The Teller of Tales – Oh, I see! Architecture is a skilful story-teller. Posing as a passive onlooker, creates niches of memory that return from time to time as nostalgia. Walls, shop signage, electricity cables, windows, rusty benches and tattered awnings are useless to our recollections when thought of singly. Together, they recreate frames of reflection from memory. 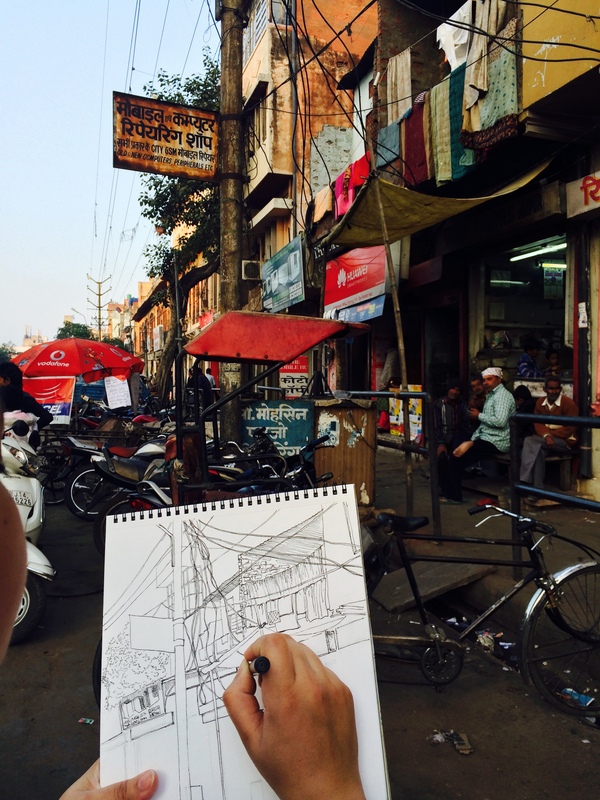 I sketch around Jaipur quite often and have been doing so for many years. Some places are a sketcher’s heaven in terms of (zero) disturbance and clean views while some are saturated with noise (both visual and audible). The cacophony of autorickshaw, bus and car horns, yelling people and wandering animals- Cows and dogs mainly (In some areas, you’d see monkeys too)- is a given in most locations here. I have a fear of dogs (and most other animals) so I paint sitting in the parked car and my subject depends on what lies in front of me or nearest/ easily visible. 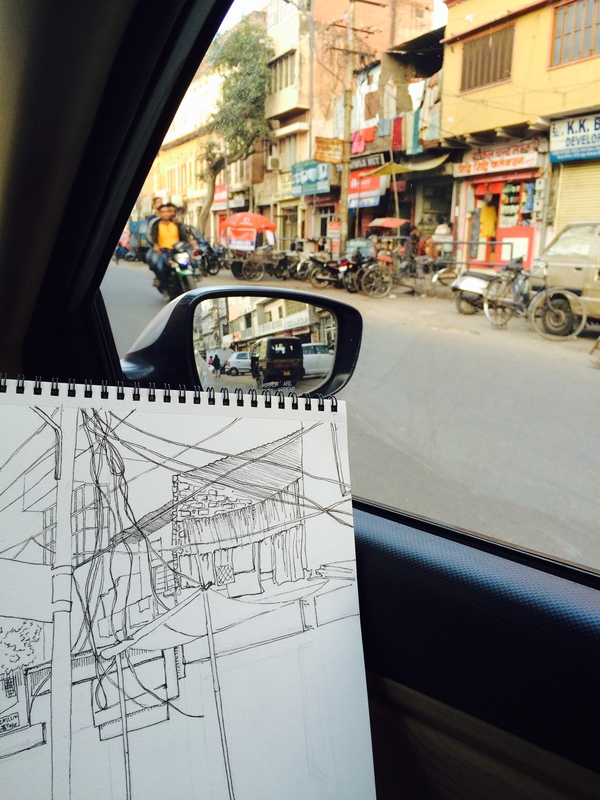 Sketching on Location, Moti Doongri Road, Jaipur. M.D.Road (Moti Doongri Road) is a heavily crowded area in Jaipur which has all kinds of shops and tiny cafeterias. 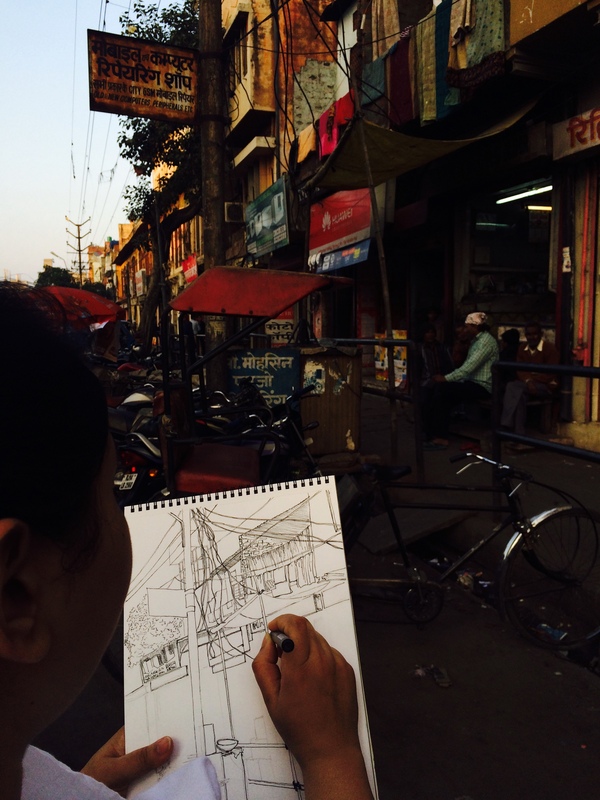 Above the shops, are dwellings (usually belonging to the shop owners) so one has to keep in account the level of activity that takes place there which is often frustrating while sketching because every second, your view is interrupted. However, it also is the reason I return there for sketching. I love the feel of the street with women carrying jute bags shopping for groceries or perhaps out buying knick-knacks from carts parked nearby. Pocket mirrors, wall mirrors, sieves and combs with their plastic shine and fluorescent colors lie arranged in bundles. Amidst the engaging activity, my eye is pulled to the electricity poles ridden with additional wires. The wires seem to have a mind of their own and the tangled mess that it appears to be, orchestrates its way into different shops. 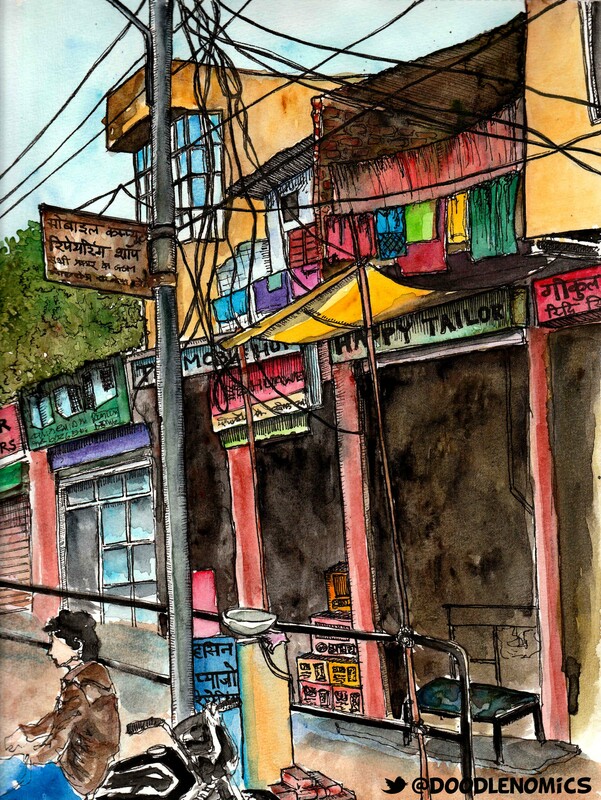 The labyrinth of coiled and twisted wires mimics a typical day in the lives of residents of Moti Doongri. I keep going back to sketch the language of these wires against the architecture because in my mind, it narrates the story of human struggle and illustrates the might of the human spirit to keep moving forward, overcoming obstacles and accepting any change of course as part of the journey.